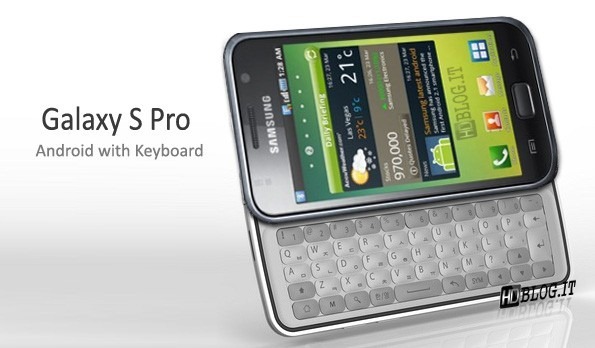 Samsung Galaxy S Pro. That's a mouthful. It is also a beauty (supposedly...the picture below is just a render). 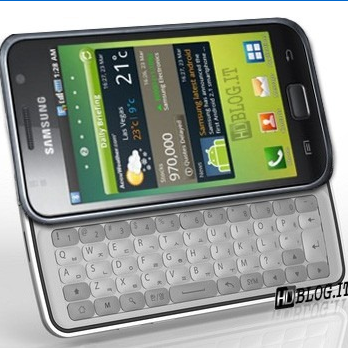 According to the legendary Eldar Murtazin, the editor of Mobile-Review and a well respected tech journalist, Samsung's going to be tacking on a keyboard to the already lustworthy Galaxy S. Because none of the good things in life are free, the privilege to have actual keys to pound on while you're definitely not texting and driving (really officer, I wasn't) will cost you additional 50 Euros (That's around $67 for those of us in the States). The keyboard is really just the icing on the cake Eclair. This phone is also packing a gorgeous 480x800 SuperAMOLED screen and it's all powered by Samsung's own take on the ARM Cortex A8 -- the 1GHZ Hummingbird. Determined to make my Nexus One weep, Samsung is also throwing in 720P video recording and playback, Bluetooth 3.0, and 802.11N WiFi. Really, this thing is a beauty, and if the rumors prove true, and the keyboard is in fact added, it will be one of the most powerful Android phones you can pick up with the a physical set of keys. Between this and the Sprint HTC Evo 4G, this year is shaping up to be a mighty good one for Android lovers. We'll be keeping an eye out for any more details we can find on this beast. Thanks to HDBlog.it for the render, and Eldar Murtazin's twitter for breaking the news.